A new map that features mountain biking trails and road cycling routes in eastern Tooele County is now available at most Wasatch Front bicycle shops and other outlets. Called “Tooele County Trail Map – Eastern Portion,” the full-color publication highlights 12 multi-purpose/mountain biking trails, six road cycling routes, and two ATV recreation areas. 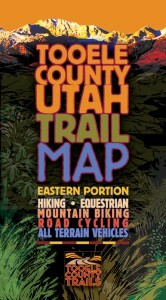 The map’s trails, routes and related information are also on the web at www.tooelecountytrails.com. Users of the printed or digital version of the map will find detailed “break out” maps that explain the way to go, plus specify trail type, distance, elevation profile, difficulty rating, trail time, signage, GPS waypoints, and other trail facts. Included with each breakout map is a narrative that ties all of the information together, and describes what the trail/route user can experience along the way. All breakout maps on the website are downloadable and printable portable document format (PDF) files. The new website was also designed and programmed to be usable on smart phones. The map and website are the work of the Tooele County Trails Committee, which was organized a few years ago by Tooele County Parks and Recreation to inventory trails, install directional signage and trailheads, and promote responsible trail usage. The 11-member committee is comprised of citizens and one county commissioner. McKendrick stressed that the overall map project is a “work-in-progress.” Tooele County is Utah’s second largest at 7,000 square miles; understandably, the inventory process of the county’s countless trails is expected to take years to complete. The new map features trails and routes in a 1,900 square-mile geographical area that extends from Stansbury Island to Simpson Springs, and from the Oquirrh Mountains to the Stansbury, Onaqui and Sheeprock Mountains. Although the map features fantastic road cycling routes, the biggest attractions are the mountain biking areas such as “Serengeti,” “Oquirrh Wave,” “Jacob City,” “Lion Hill,” the “Stansbury Front Trail” and others. The map and website were created by Transcript Bulletin Publishing in Tooele for the Tooele County Trails Committee. Work on the main map and 20 breakout maps began in July 2011 with reconnaissance rides of every trail and route. Signage, distance, elevation, GPS waypoints, and other vital trail information were documented, along with geographical, geological, and historical values for trail and route narratives. In addition to availability on the web and at Wasatch Front bike shops, the new map will become available at visitor centers on I-15 and I-80 in Utah, plus at brochure racks in Tooele County. For more information, call Tooele County Parks and Recreation at 435-843-4020, the Tooele County Chamber of Commerce and Tourism at 435-882-0690, or Transcript Bulletin Publishing at 435-882-0050.